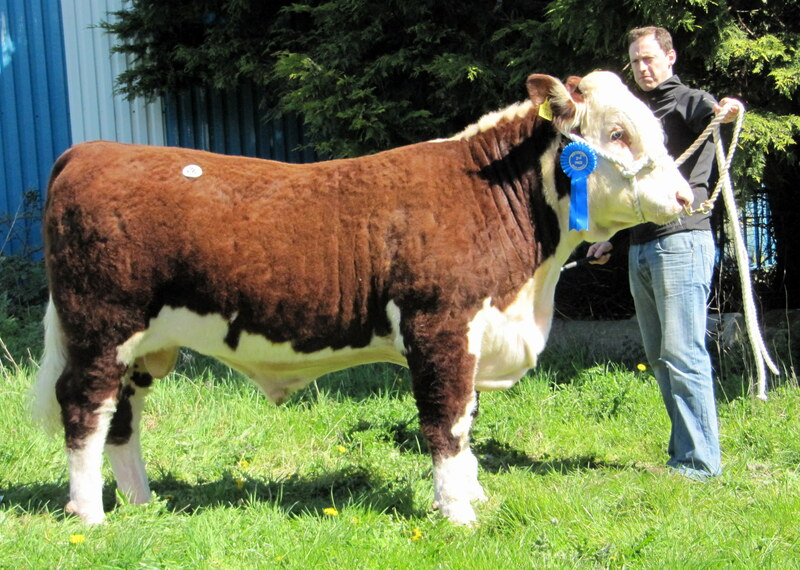 The IHBS report another terrific sale for Herefords at Nenagh following on a very good outing at Kilkenny just a few days ago. The sale held on a day of brilliant sunshine saw a range of prices from €4,500 to €2,200. The crowd somewhat smaller than usual were intent on purchasing and taking a bull home. Great grass growth in recent days together with the start of the breeding season has injected a further sense of urgency in the sales. 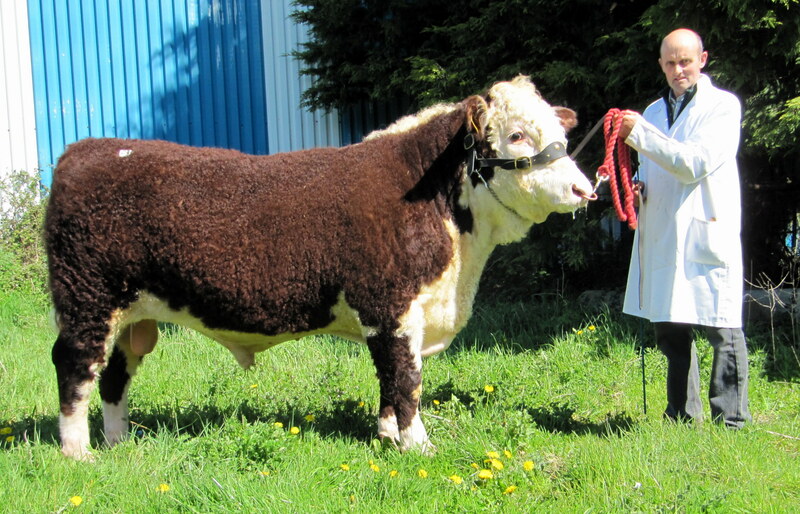 Numbers of Hereford bulls are tightening as sales on farm and at the marts continue apace. Trillick Tyson proved to have the knockout punch when bidding stopped at €4,500 to secure the top price of the day for well-known Longford breeder JJ Farrell. This son of his UK bred stockbull Freetown Hotspur is out of Trillick Sally and was purchased by Connor Lynch who travelled all the way from Dundalk in Co Louth. 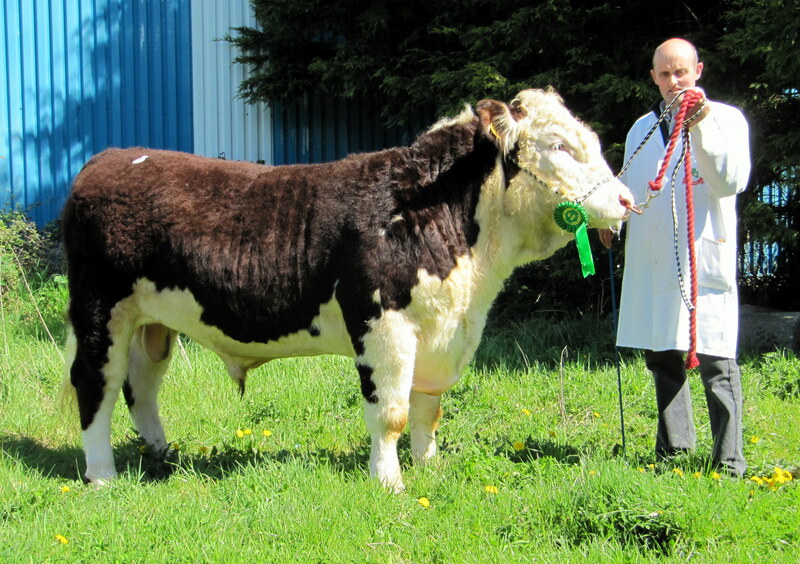 A further son of Hotspur exhibited by Mr Farrell, Trillick Niall out of Trillick Linda was bought as a herd sire by Hereford breeder Richard Wallace, Crettyard, Carlow at €3,700 to average €4,100 for the two bulls exhibited. Ballyheigue, Co Kerry breeder Kieran Harty and son Stephen exhibited Ocean Richard. A second prize-winner sired by Dovea AI sire Glaslough Esquire out of Ocean Special Flora he was purchased by Portumna dairy farmer John Heagney at €3,750. Glaslough Nero was shown by Sam and Nigel Heatrick, Glaslough, Co Monaghan who were well satisfied with the €3,700 achieved. This November born bull is by herd sire Cill Cormaic Isaac out of the homebred dam Glaslough Karen. He was purchased by Pat O’Donoghue, Mallow, Co Cork. 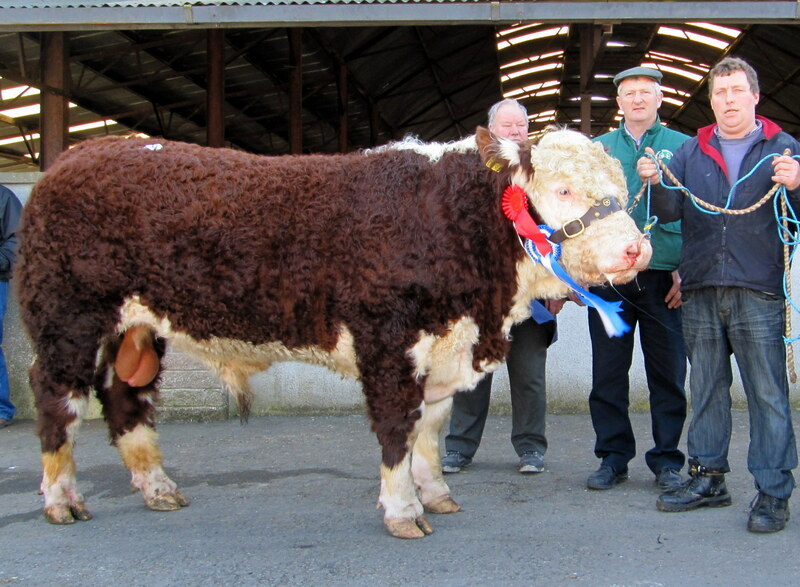 The championship was awarded to Moyclare Magnificent a bull from Michael Molloy, Belmont, Co Offaly. Mr Molloy has had a very successful year to date winning several championships and achieving top prices at various venues. Magnificent is sired by his herd sire Brocca Saviour a Bowmont Storm A584 son bred by his neighbour Noel Farrell. Saviour was the number one Hereford sire on the ICBF December 2014 evaluations and is credited with much of the success recently achieved. 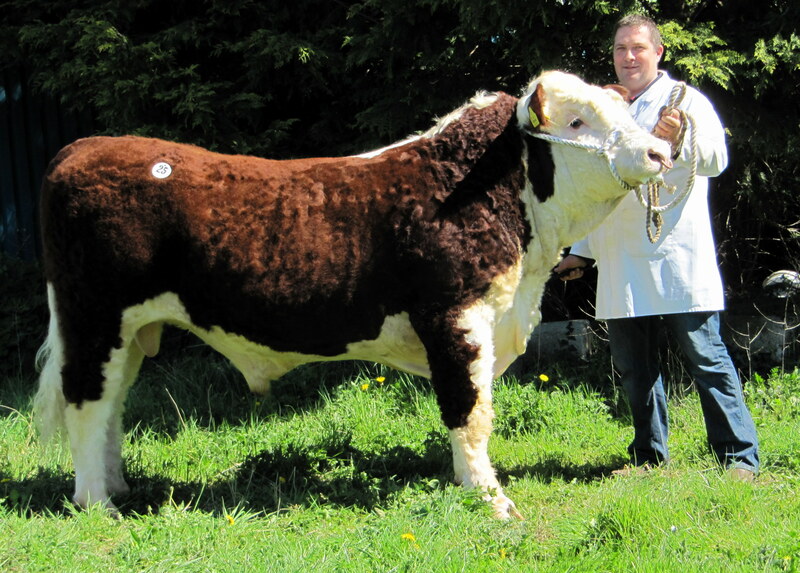 The dam is Moyclare Rose 10th and the purchaser at €3,500 is well known, long-time Hereford breeder and Judge Tom Ludgate, Kilgubban, Mallow. 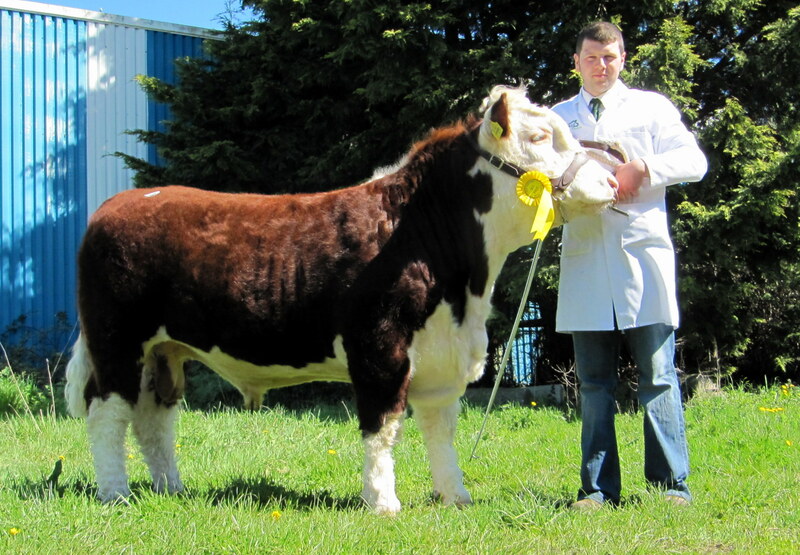 One to watch for in the future is young Hereford breeder and enthusiast Hugh P Murray of Kilbeggan, Co Westmeath who exhibited Newland Goss. This well turned out February born son of Castledaly Jeff was calf champion at Strokestown last summer, is out of Castledaly Bid and sold to Michael Mahon, Rathdowney, Co Laois when the hammer dropped at €3,400. 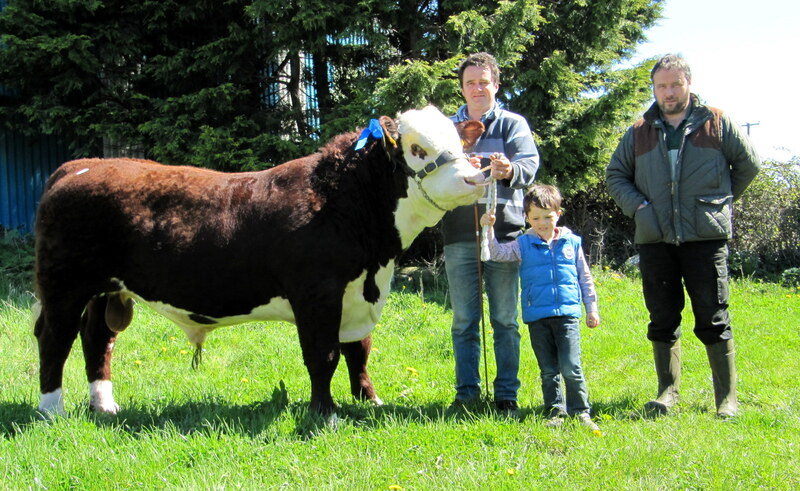 The Reserve Champion Ballinveney Pirate a very long Bowmont Storm A584 son was shown by Rory Farrell, Toomevara with the assistance of his show team, sons Daniel, Brian and Seamus. 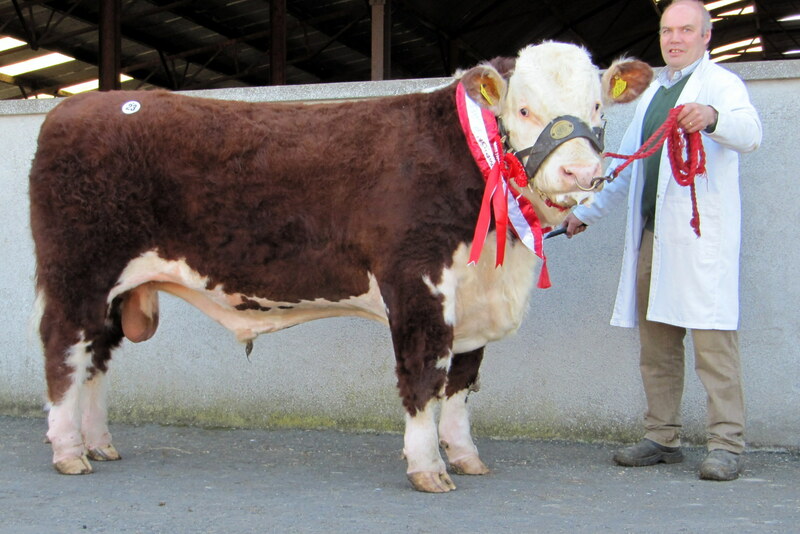 Out of Ballinveney Clodagh he was purchased at €3,350 by local man Matt Crowe, Templederry, Nenagh. Grianan Nobleman from the herd of Tom and Anselm Fitzgerald, Mount Temple, Moate was sold at €3,300 to Michael Murphy of Newport, Co Tipperary. A further son of Bowmont Storm A584 one of the most successful sires imported from Australia by the Society and out of Grianan Dominique a top performing dam at the Grianan herd. Hereford calf prices continue to be a source of discussion with further reports of outstanding prices achieved at Castleisland, Listowel, Kilmallock, Bandon, Skibbereen and Kilkenny. Quality assured stock for slaughter are urgently required if you have such stock available or will have in the weeks and months ahead please call 044/9348855 for further information on the best possible outlets for such stock. The Society’s next sale takes place at Kilmallock on Friday next April 24th.